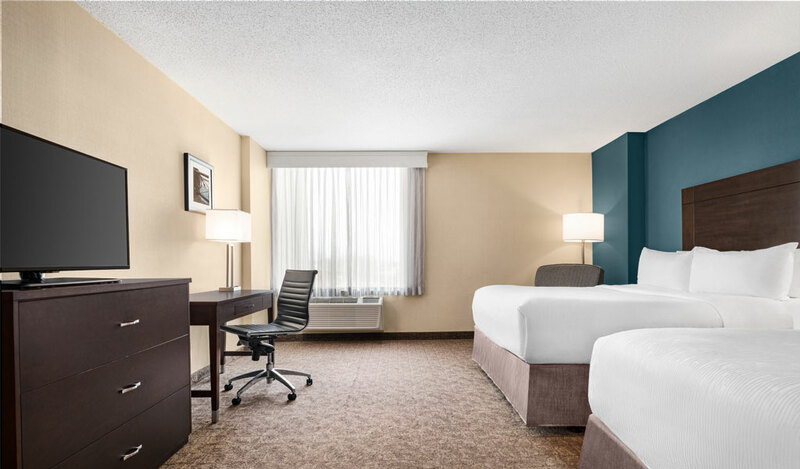 This brand new, spacious guestroom features 1 king bed with premium Simmons pillow top mattresses and faces the city of Niagara Falls. This guestroom also features a Jacuzzi, pullout coach and TV in a separate living area as well as kitchenette including a sink, microwave & mini fridge. 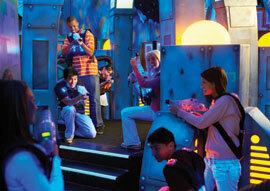 The sleeping area includes a beautiful fireplace as well as its very own big screen TV. Amenities found in every room include: Complimentary Wi-Fi internet access, Alarm Clock Radio with mp3 player connection, WynRest Bedding, Coffee Maker with Reunion Island brand Coffee and English breakfast tea, Samsung 37 Flat-Screen TV with free HBO and 30 channels (19 HD), work desk with ergonomic chair, bath products by Human + Kind, and other standard amenities. 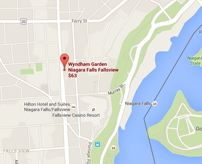 All rooms at The Wyndham Garden Niagara Falls Fallsview are non-smoking. 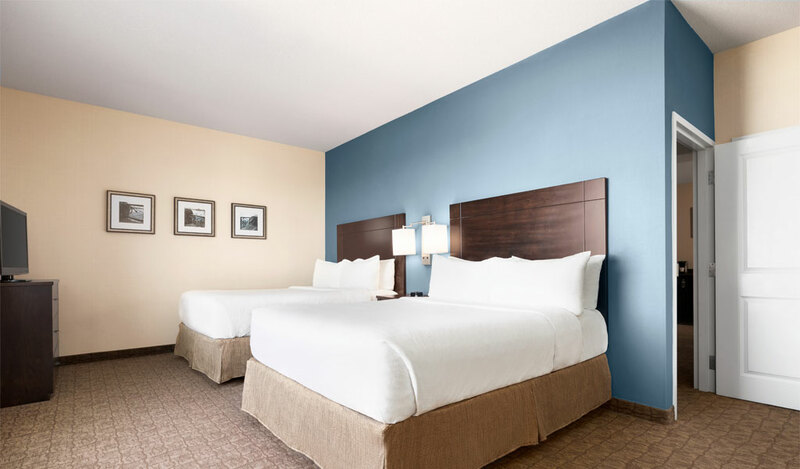 These brand new guestrooms feature 1 king with a premium Simmons pillow top mattress and face the city of Niagara Falls. Amenities found in every room include: Complimentary Wi-Fi internet access, Alarm Clock Radio with mp3 player connection, WynRest Bedding, Coffee Maker with Reunion Island brand Coffee and English breakfast tea, Samsung 37″ Flat-Screen TV with free HBO and 30 channels (19 HD), work desk with ergonomic chair, bath products by Human + Kind, and other standard amenities. 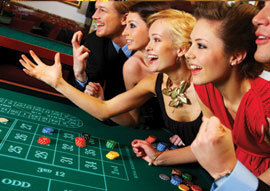 All rooms at The Wyndham Garden Niagara Falls Fallsview are non-smoking. 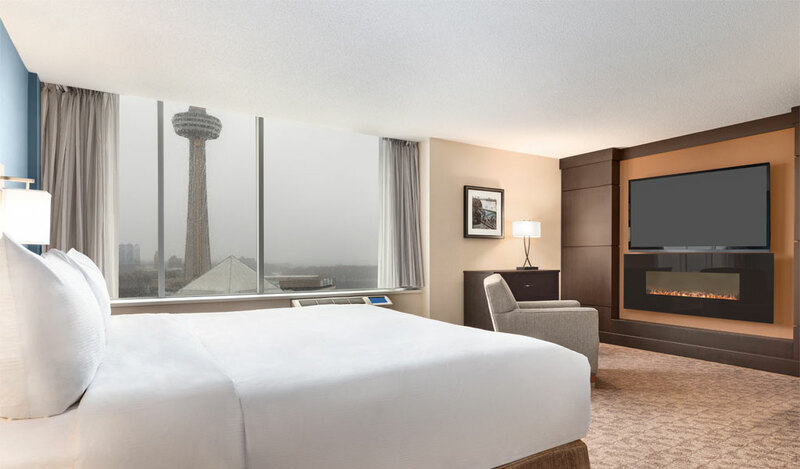 These accessible suites feature 2 queen beds with a premium Simmons pillow top mattress and face the city of Niagara Falls. In addition to standard amenities, these rooms also include a separate sitting area with pull out couch and extra TV, kitchenette with microwave, mini fridge and sink, separate dining area, and roll in shower with transfer chair. Amenities found in every room include: Complimentary Wi-Fi internet access, Alarm Clock Radio with mp3 player connection, WynRest Bedding, Coffee Maker with Reunion Island brand Coffee and English breakfast tea, Samsung 37 Flat-Screen TV with free HBO and 30 channels (19 HD), work desk with ergonomic chair, bath products by Human + Kind, and other standard amenities. 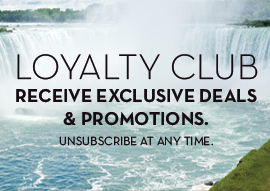 All rooms at The Wyndham Garden Niagara Falls Fallsview are non-smoking. 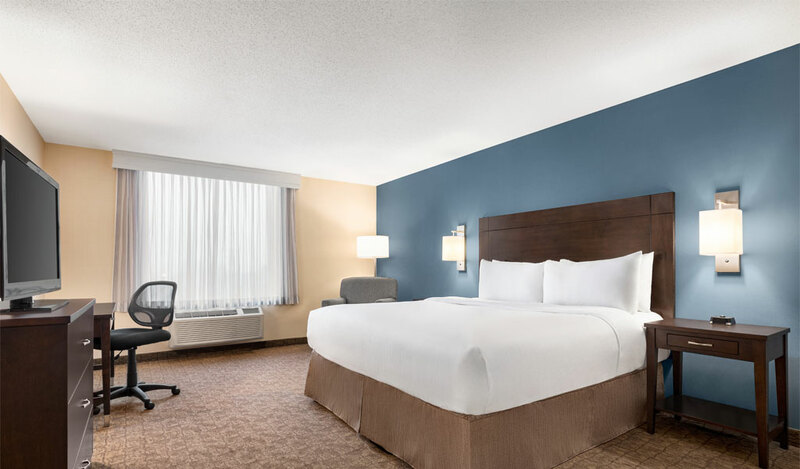 These brand new guestrooms feature 1 king bed with a premium Simmons pillow top mattress and face the city of Niagara Falls. In addition to standard amenities, these rooms also feature an in-room whirlpool for two and a separate walk in shower. Amenities found in every room include: Complimentary Wi-Fi internet access, Alarm Clock Radio with mp3 player connection, WynRest Bedding, Coffee Maker with Reunion Island brand Coffee and English breakfast tea, Samsung 37″ Flat-Screen TV with free HBO and 30 channels (19 HD), work desk with ergonomic chair, bath products by Human + Kind, and other standard amenities. All rooms at The Wyndham Garden Niagara Falls Fallsview are non-smoking. 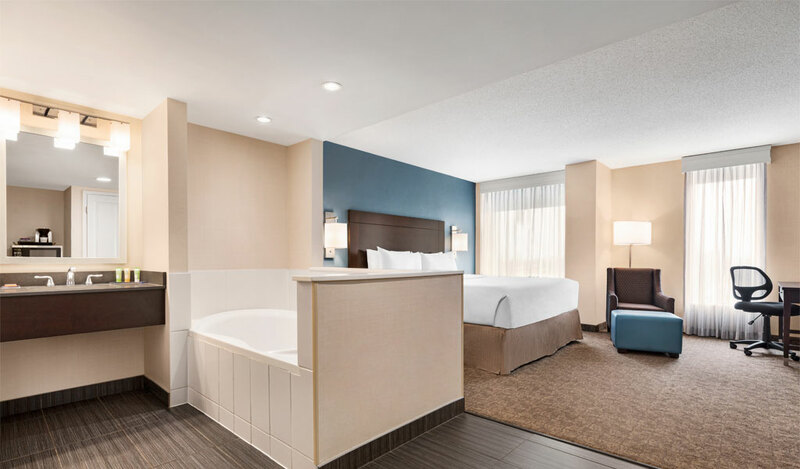 These brand new guestrooms feature 2 queen beds with premium Simmons pillow top mattresses and face the city of Niagara Falls. Amenities found in every room include: Complimentary Wi-Fi internet access, Alarm Clock Radio with mp3 player connection, WynRest Bedding, Coffee Maker with Reunion Island brand Coffee and English breakfast tea, Samsung 37″ Flat-Screen TV with free HBO and 30 channels (19 HD), work desk with ergonomic chair, bath products by Human + Kind, and other standard amenities. 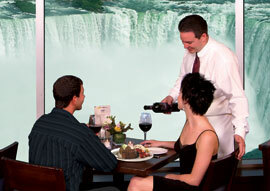 All rooms at The Wyndham Garden Niagara Falls Fallsview are non-smoking.